This has become addicting. I have decided to name this line of yarns "Hidden Treasures." 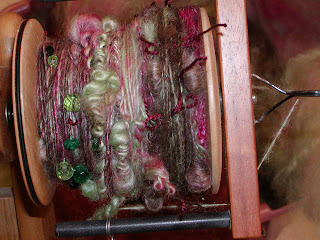 The above yarn is a blend of raspberry and green with touches of brown Shetland. There are beads, butterflies and bows in this yarn. 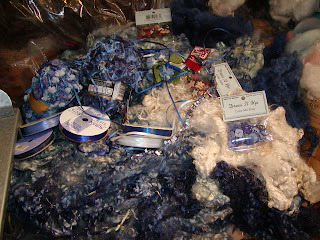 This is the stash for the yarn I will start spinning tomorrow. I went to Michaels intending to get some shades of orange buttons and beads and could not find anything that matched it - and they have a lot of stuff! I decided to just go with navy and raspberry for my next two yarns. I was really happy when I got to the register and realized that most of what I bought was on sale: 33-40%. I promised myself that I would spin one or two smaller skeins of normal stuff, so I am finishing up some angora rabbit. I plucked Parsley, the French rabbit this afternoon and sat down at the wheel to spin it immediately. It is amazingly soft. I carded some with red kid mohair and some with a grey lamb Shetland just to see how they would turn out. It made the Shetland nicer, but the best was just angora. Kyle gave me his two movies from Blockbuster and said that I might like them, so I can go back to spinning.